Professional paintball company offering fully supervised combat adventure in Wellington's largest outdoor bush field. Great for team building, family parties, groups of friends and special occasions. 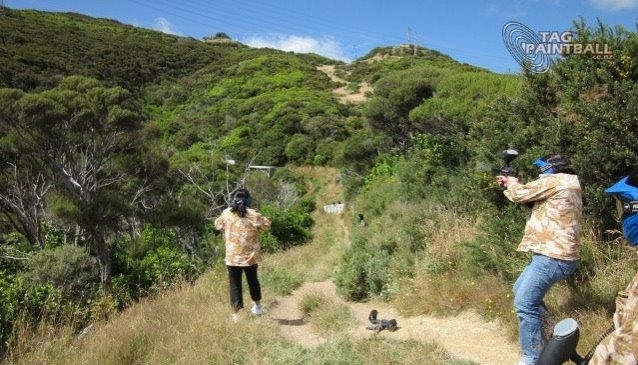 TAG Paintball has two locations just outside Wellington CBD. Grenada North has a 10-acre bush field, the largest in the city. Pomare has two fields (soon to be three) and is slightly further east. A completely safe, energetic and strategic outdoor activity, the aim is to 'capture the flag' of the opposing team, whilst protecting your own. Each team member is provided with a paintball gun and non-toxic paintball pellets. Once the game starts, you have acres of open and bush field to navigate. Use the tyre towers, cones and natural woodland to hide from the 'enemy', as you make your way closer to their flag. If you've never played paintball before, get ready to discover a whole new world of adrenaline-pumping excitement. Wild Discoveries these April School Holidays at Staglands! Be a Certified Staglands Explorer! Join Staglands’ Wild Discoveries and learn more about New Zealand’s native birds.